1. Security method for payment transmission. We respect and are committed to protecting your privacy. We do not collect personally identifiable information when you visit our site. The contact information you provide to us will be used strictly to communicate with you and will never be shared with any third party. 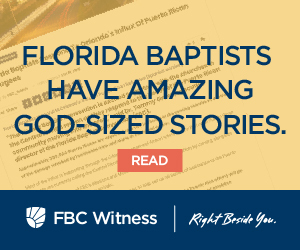 In order to enable special web site features, the Florida Baptist Convention requires the use of “cookies.” Cookies are small data files stored on your computer by your web browser. The cookies we create on your computer do not contain personal information and do not compromise your privacy or security. Products: Any product ordered through the Convention’s website may be returned for a full refund within 30 days of ordering, excepting for any shipping charges paid. The returned product should be unused and undamaged (unless damaged in shipment). Any packing slip enclosed with the order should be returned with the product and/or materials. The returned products should be shipped to the attention of the department from which it was ordered, c/o Florida Baptist Convention, 1230 Hendricks Avenue, Jacksonville, Florida, 32207; telephone 904-396-2351. All refunds will be provided as a credit to the credit card used at the time of purchase within five (5) business days upon receipt of the returned merchandise. Training Events: Refunds for training events are stated on the respective event registration page. Typically refunds are provided if you cancel your registration by the stated refund deadline. Training event refund policies may vary by department. All requests for refunds that comply with the refund policy shall be provided as a credit to the credit card used at the time of the on-line event registration. 4. Age-restriction products, if any, are clearly identified. The Florida Baptist Convention does not offer age-restricted materials. However, in compliance with the Children’s Online Privacy Protection Act (COPPA),if a child under the age of thirteen chooses to send an e-mail or other electronic request to the Florida Baptist Convention, the respective Convention program department may respond to that e-mail or request. However, no personal information (including name, address, e-mail address, telephone number, social security number, electronic IP identifier, or combination of various identifying elements) of a child shall be permanently collected, stored, or disclosed. This same non-disclosure policy shall apply to all personal information temporarily collected for the registration of children at Convention-sponsored events (i.e. summer camps, music programs, Bible drills, etc.). Ordered items are typically shipped via U.S. Postal Service or UPS (United Parcel Service). The selection of the shipping method is made at the Convention’s discretion based upon the weight of ordered item, the required timeliness for delivery and the most economical shipping charges. Some resources and their shipping are provided at no charge. This is made possible by means of Florida Baptists’ giving through the Cooperative Program.